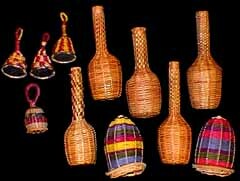 Caxixi are woven basket rattles from Brazil. Used in parts of Africa, it was in Brazil that the smaller sized caxixi became adopted for use in conjunction with the berimbau. The larger sized caxixi were first used on recordings by Airto Moreira but it was Naná Vasconcelos who furthered the use of caxixi for rhythmic accompaniment and colors.